Our rugged smart displays typically combine data entry keypads or switch arrays on the front-panel bezel with specialized communication I/O and internal power conversion from standard vehicle or aircraft power sources (12V DC, 28V DC, 115V AC 400Hz). These military-grade computers are packaged in fully sealed enclosures of steel, aluminum or molded composite. 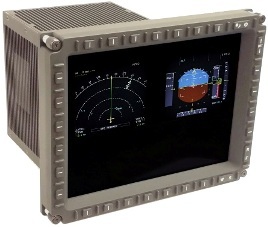 IEE has been delivering military display solutions for over 70 years. The following are some examples of our rugged smart displays.